This project—focused on the US Highway 550 connection to US Highway 160, south of Durango—is part of long-range planning to enhance transportation for Southwest Colorado. The connection is a key component for future growth providing mobility, safety, economic vitality and connectivity for the entire Four Corners area and all communities within this region which are currently seeing significant amounts of growth. Neighborhoods and developments near the project have seen increased use with La Plata County's and the City of Durango's completion of Wilson Gulch Road. Completion of this project will provide much safer and more efficient access to the area's regional hospital, and the Grandview and Three Springs neighborhoods. the City of Durango business development. Regional freight transportation will also benefit from the enhanced mobility. The project improvements will greatly enhance safety for both private passenger and commercial vehicles. 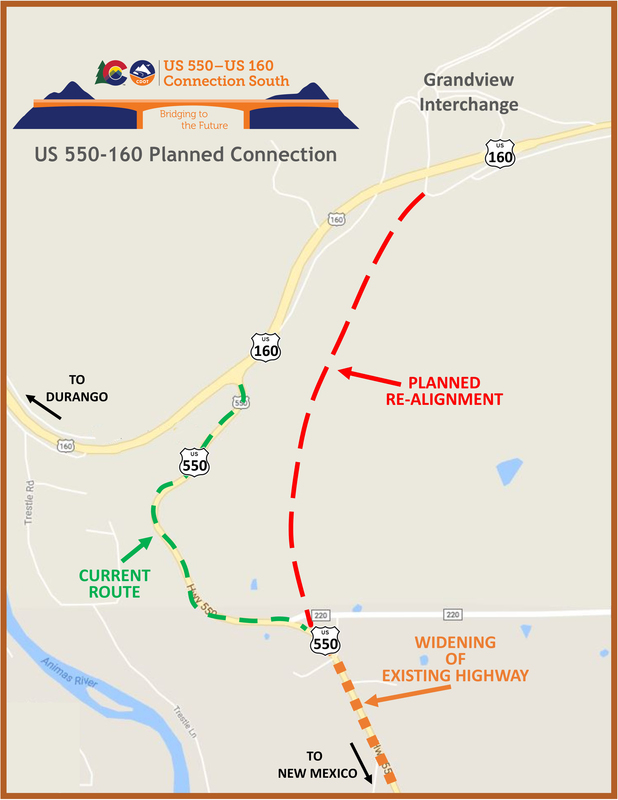 The connection, south of Durango, will realign US 550 directly into the existing US 160 interchange, eliminating the steep and windy grade of the current US 550 Farmington Hill and improving roadway geometry. The new highway alignment will include state-of-the-art de-icing technology for a safer road surface during freezing weather conditions. The connection will eliminate the need for the existing light signal at base of US 550 Farmington Hill. The project will include wildlife highway mitigation features which will reduce animal-vehicle collisions. US 550 and US 160 are truck routes, which provide significant freight mobility for oil and gas, agriculture, and other industries, while also ensuring safe and reliable travel for critical goods and services to and from New Mexico and the Four Corners region. The project will provide connectivity to a new urban core, including the regional hospital; police department; retail and business district; and residential neighborhoods.